Yuzu (Citrus junos) is an Asian fruit with a bumpy peel and a fun name. This member of the citrus family smells like a cross between a grapefruit and a mandarin orange with a hint of floral. The fruit is used in a yuzu-yu (yuzu bath) – a hot bath to ward off winter illness and impart a sense of wellbeing. 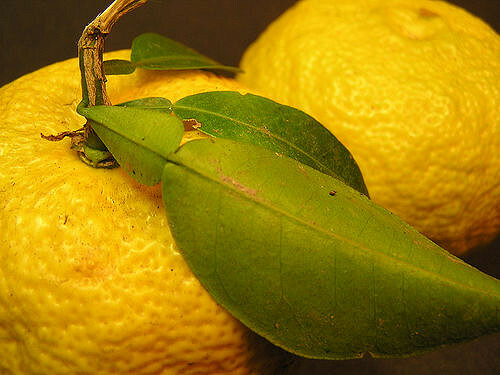 The fruit also produces an essential oil with a unique citrus scent that is popular in perfumery. The essential oil has other therapeutic uses as well. It kills many germs, as shown by its antibacterial, antiseptic, and antiviral properties. The oil can also ease muscle aches and pains along with arthritis and rheumatism. The addition of Yuzu as an integral ingredient in Japanese ponzu sauce might be attributed to its taste along with its ability to aid digestion. Another study was done, this time to evaluate Yuzu essential oil’s ability to reduce inflammation. The researchers concluded it “may have potential anti-inflammatory efficacy for the treatment of bronchial asthma.” Because the oil is also believed to be antispasmodic and expectorant, it is no surprise that it could help asthmatics. This fragrant oil may best be used in diffusion to impart easier breathing and stress reduction. Add a few drops to a diffuser or sniff off of the bottle to gain its many benefits.